Global Financial Integrity study affirms that India tops in global illegal outflows, while Russia is in sixth place. Russia has lost $782.5 billion in “illicit” capital flight over the last 18 years while $552.9 billion of illegal money has entered the country over the same period of time, says a recent study by Global Financial Integrity (GFI). These figures could be a gross underestimation, however, as they don’t include estimates of money transferred by criminal groups engaged in things like drug smuggling and prostitution," GFI Director Raymond Baker said in the report. “Russia ranks sixth globally for the size of illegal outflows behind India, Indonesia, Malaysia, The Philippines and Nigeria. The GFI report said that the cause of the outflows is corruption, financial crime and inefficient customs administration. “This flow is the proceeds from crime, corruption, tax evasion,” says the report, which used the World Bank’s methodology to calculate both declared and undeclared outflows. Of the total 63.8 percent was made via unrecorded wire transfers. Transfer pricing – selling commodities to shell company registered overseas at knock down prices – is another favourite way of sending money offshore. The report highlighted the poor control over Russia’s customs service as a big part of the problem, “the weakness of which supports the shadow economy,” the report said. Russia’s Economics Minister Andrey Belousov, who called the Customs Service one of the main “bottlenecks to Russia’s economic development,” echoed the same sentiment earlier this year. Improving Russia’s customs service is one of the 22 roadmaps for reform the government launched last year as part of its effort to improving its ranking on the World Bank’s Ease of Doing Business from its current 112th place out of 185 countries to 20th by 2018. Of the eight factors that go into making up Russia’s score, Russia’s performance on customs is one of the worst. The government has been concerned as even the visible capital outflow spiked following the onset of the 2008 crisis. At the start of the last decade capital flight had fallen to $1 -$8 billion a year, but ballooned as the economy went into free fall after Lehman Brothers collapsed to $133.7 billion by the end of 2008. In the next two years the amount of flight capital fell again, but alarmingly jumped back up to $80.5 billion in 2011 compared with $34.4 billion in 2010. The outlook for this year is better with analysts and the government expecting capital flight to fall to around $50 billion, which is still significantly higher than pre-crisis levels. However, the report found that things are improving slowly as the size of the shadow economy has fallen from 46 percent for most of the last decade to 35 percent in 2011. Finance Minister Anton Siluanov said that part of the problem is that 25 percent of Russia’s money mass is cash, against the 7-10 percent normal in OECD countries and suggested regularly changes to encourage salaries to be paid by bank transfer, to promote the use of plastic cards and set a limit to the size of allowed cash transactions. “It is essential to reduce the level of cash payment in the economy, which currently comprises 25 percent of all turnover, over 100 percent more than in developed markets, and even 50 percent more than in other developing markets,” Siluanov said in an interview with business daily Vedomosti last year. The size of Russia’s shadow economy is 3.5-times larger than any other G8 country due to inefficiencies with public administration and tax evasion. The Kremlin has finally started act by significantly stepping up the anti-corruption drive last November. Since then a number of high level public officials have come under the spotlight. In the most recent case State Duma Deputy Vladimir Pekhtin asked to be temporarily relieved of his duties as chairman of the Duma's Credentials and Ethics Commission after opposition blogger Alexei Navalny posted documents showing Pekhtin, who is a founding member of the ruling United Russia party, owns $2 million worth of US property that he had failed to declare under the government’s own transparency laws for members of parliament. Russian police investigated over 50,000 corruption cases in 2012 and convicted more than 7,000 people on graft charges. “These figures show that despite all implemented measures, corruption is one of the most burning issues, moreover, it has penetrated all spheres of social life in Russia: authorities, housing services and utilities, education, healthcare, law enforcement. 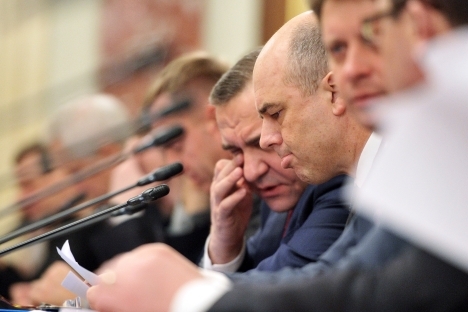 And attempts to equate ‘official and corruptor’ are superficial and unfair,” Federation Council Speaker Valentina Matviyenko said at the all-Russia anti-corruption conference, which opened in Kazan on St Valentine’s Day. “If we don’t truly overcome [corruption], the country won’t be able to successfully develop and move forward,” she said.